Shara Michelle v. Robert Baty – Hacking Charge! – Kent Hovind v. Robert Baty – The Great Debates! Home→Shara Michelle v. Robert Baty – Hacking Charge! Robert Baty hacked into the FaceBook account of Shara Michelle and took private conversations and posted them publicly, exploiting her son. What I have to offer are the FACTS. YOU have possession of my private posts from 2015, that were never public. And YOU posted those in article exploiting my minor child. 1. Shara posted the messages in question on her FaceBook page. 2. What settings she may have used in doing so are not known. 3. Many people were able to observe the messages in question. 4. Without regard to the FaceBook settings, the messages were, in effect, public. 5. I posted the messages in question in my related article referenced below. 6. There is no exploitation of any child in my reporting on the messages. 7. There is no reason for me to disclose my sources and methods as to my acquisition of the questioned messages. 8. The burden here is on Shara to establish that I came by the messages by “hacking” into her account and she has offered nothing in support thereof. I call on Shara Michelle to explicitly, unequivocally withdraw her accusation against me or submit her second affirmative in an effort to try and establish her charge against me. You know exactly what settings were used on the comments. The symbols for settings are on them for friends not public. How did you get into my FB comments that are NOT public? Who did you send in or how did you get in? I think I learned something today; FaceBook posts sometimes have little symbols on them that indicate whether they are public or friends only or some other variation, including a “me only” option. I went and checked and it is the case that some of the questioned messages appear to include the symbol for “friends”, and it seems to me that Shara had lots and lots of friends, as she does now. So, in a legal sense, Shara shared her posts with lots of people and the posts became quite public. Shara again implies that such is no evidence that I did any “hacking”, and that is the issue in this debate. I again call on Shara Michelle to explicitly, unequivocally withdraw her accusation against me or submit her third affirmative in an effort to try and establish her charge against me. If Shara does not explicitly, unequivocally, withdraw her charge against me, then maybe we can work out the logistical details necessary to complete the discussion of this charge against me which has now been rather common amongst my adversaries. Rather than explicitly, unequivocally, withdraw her charge against me, or enter into the negotiations for the development of the discussion of her charge against me, she has “punted” and implied she has no basis, no “documents”, no evidence to support her charge against me. 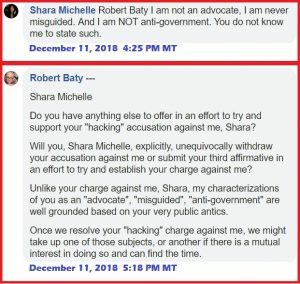 On December 7 & 8, 2018 Shara and I had an extensive, extended exchange via FaceBook and she steadfastly refused to openly and honestly engage the proposed discussion of her “hacking” accusation against me. She did post the following, however, and I will incorporate it into the text of the discussion above and offer my response. The following comments from Shara Michelle as posted to the Samantha Brown thread will be treated as Shara’s second affirmative, added to the text above, and followed by my response.